This is a tight freeway loop around downtown Youngstown, similar to the Inner Loop in Rochester, New York, comprised of parts of I-680, US 62/Ohio 7, US 422, and Ohio 193 (Aerial photo). The atlas of Mahoning and Trumbull Counties by Commercial Survey Company calls the I-680 section "Wickliffe Drive" (on the main maps) and "South Shore Drive" (on the downtown inset); the US 62/Ohio 7 section the "East River Crossing"; and the US 422/Ohio 193 section the "Madison Avenue Freeway" with its bridge over the Mahoning River called the "West River Crossing" (John Taber confirms the last two names as being official), or, informally, the "Blue Bridge". Approaching the crossing. This is the west end of the Madison Avenue Freeway and is also the south end of Ohio 193. 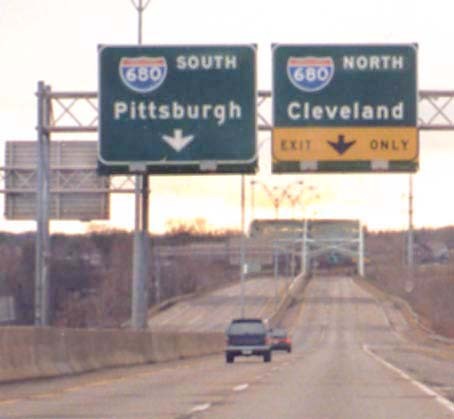 Does not help matters that the Oh 289 shield and the 'End' sign do not seem to be getting along in this photo either. As US 62/Ohio 7 (East River Crossing approach) approaches the Madison Avenue Freeway (US 422) overpass going southbound on the east side of the loop, a mysterious on-ramp appears to the right of the highway from nowhere after the ramp to the Madison Avenue Freeway Westbound branches off, then merges into it. This ramp is visible (it's bright white) in this aerial photograph. Speaking of East River Crossing, this is the northern terminus for it here at Albert St. 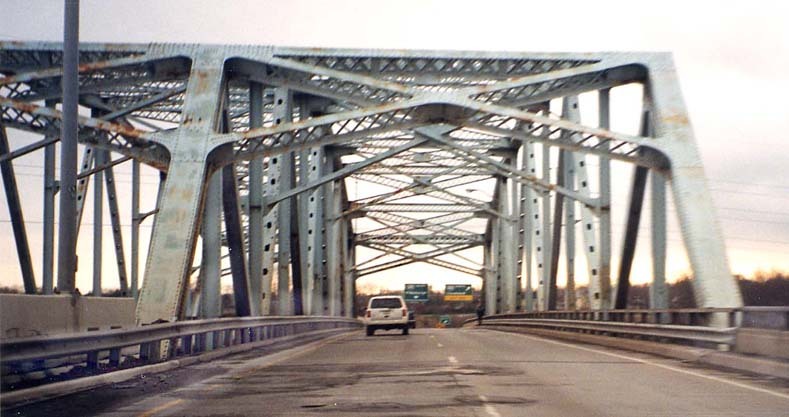 It was to continue east as the Hubbard Parkway (US 62/Oh 7) to Liberty/Early Rds, then turn to the north and end at I-80 between Oh 193 and present day US 62/Oh 7. As you can see, that's not going to happen anytime soon. The East River Crossing meets South Shore Dr. Note: The rivalry between the Cleveland Browns and the Pittsburgh Steelers National Football League teams (and to some extent their respective cities) is well-known, so it's interesting to note that both cities are listed on the same sign gantry in three of the photos above, and on the same sign in another!